Thoughts, concerns, prayers go out today for the people of Iraq’s western Anbar province, where the BBC is reporting (see HERE) that a suicide bomber rammed a checkpoint leading into downtown Rutba. At least 19 Iraqi police are dead. It’s the same checkpoint several of us cleared three years ago (see a video HERE), and, probably, some of the same police. 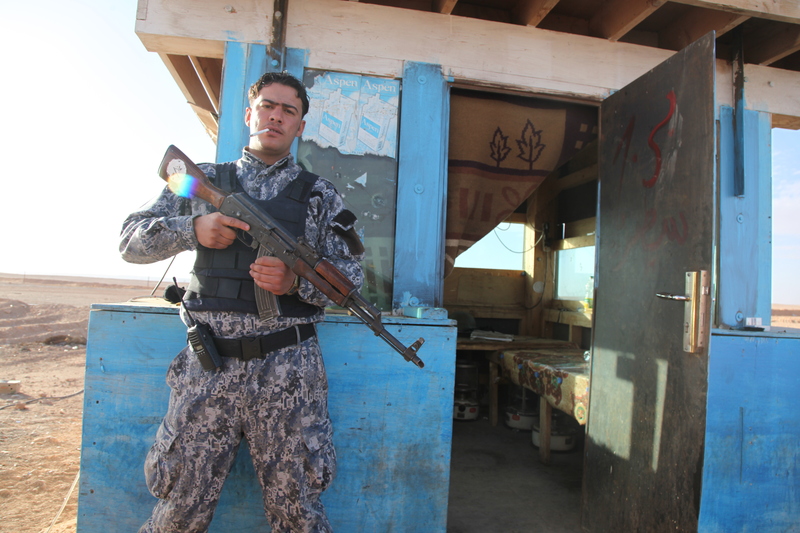 Checkpoint leading into downtown Rutba, Iraq. Photo by Jamie Moffett. I’m hoping to hear soon about the status of the Iraqis that helped protect us in 2010, especially police officers such as Lt. Marcus Amar. “Marcus,” nicknamed by the U.S. soldiers who’d trained him in police tactics, was one of the locals appointed by Rutba’s mayor to guard myself, Muslim Peacemaker Teams founder Sami Rasouli, the Simple Way’s Shane Claiborne, Christian Peacemaker Teams veteran Cliff Kindy, and Seattle Mennonite minister Weldon Nisly, among others, when we traveled through war-torn Al Anbar in January 2010. In the interview below, filmed in a darkened Rutba General Hospital after the town’s electricity shut off for the umpteenth time on that day in January 2010, Lt. Amar tells me and filmmaker Jamie Moffett about the violent transformation of his country, and how he’d reluctantly had to kill a childhood friend. Before the U.S.-led military invasion in March 2003, Iraq was a mess, for sure. Ba’athist dictator Saddam Hussein was maniacal and merciless. But with last week’s report of 461,000 Iraqi deaths attributable to the war (see HERE), and with ongoing carnage so routine that western newspapers rarely give it significant coverage, even hawkish Americans have to rethink the “wisdom” (if not spirituality) of preemptive warfare. In his stories, in his eyes, and in the way he chain-smoked a favorite brand of French cigarette, Lt. Marcus Amar looked and sounded far older than his twenty-one years. After Major Gavrilis’s Special Forces had driven out the Fedayeen in spring 2003 and disbanded the Ba’ath Party, Lt. Amar said life was “going well” in Rutba, especially if your family had been living on the wrong side of the Sunni Ba’athists. But beginning in the fall of 2004, an influx of foreign fighters flowed into Rutba from Jordan, Syria, and, especially, from Saudi Arabia, where Sunni Muslims are a vast majority. These holy men ignited a holy war, Lt. Amar said. He was in high school at the time and the insurgents offered him and his teenage friends large sums of money to kill “the enemies” of Sunni Islam, he said. But the armed Americans and Brits were not the only targets. The prey would also be Iraq’s Shia Muslims. If you killed Shia (Iraq’s new political majority), you would be paid, Marcus explained. Even if you killed them randomly and for no reason. So everyone wanted a gun. That alone was enticement. 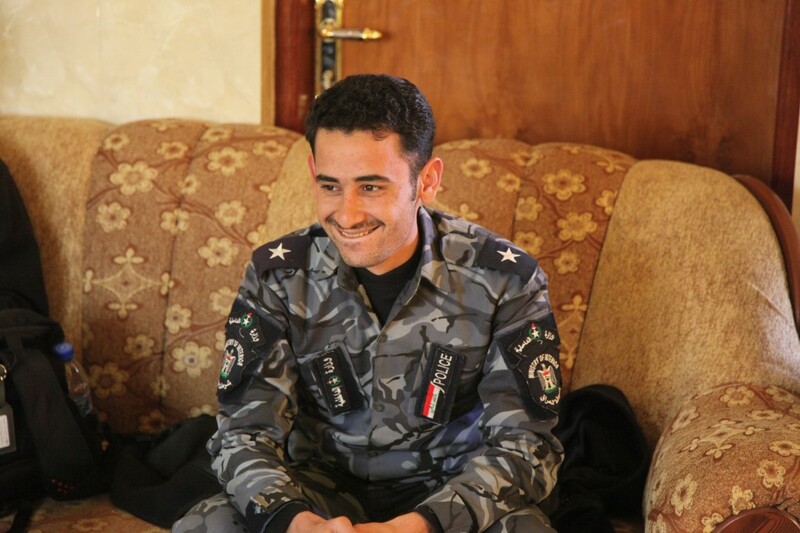 Lt. Amar had a friend who was forced to murder Shia locals immediately after he’d watched insurgents killing them. The friend said they told him to try killing a Shia and get the taste of it. Just try it, they’d insisted, like it was a sport or an initiation. They promised it would be easy. “And when he did, he said it was easy— it was too easy,” Lieutenant Amar recalled. Soon after, his friend came to him crying. But not crying about the murder, per se. He was crying about his lack of remorse. When Lieutenant Amar began working as an interior ministry policeman in Rutba, he says his circle of friends changed. It had to. Some of the guys he’d been running with in high school were now “bad guys.” And the friend who had lacked remorse, he’d become “a really bad guy,” he said. One night after Lt. Amar was given a badge and a gun, the friend asked him what he would do if he found him in Rutba carrying a weapon illegally. The question sounded like a challenge. “I would shoot you,” Lieutenant Amar said. Two weeks later, he and another officer responded to a call about two men with weapons outside of Rutba’s only hotel, a mud-brick mom-and-pop on the main drag near Rutba General Hospital. Police and the “bad guys” ended up in a gunfight, and the bad guys lost. When Lieutenant Amar went closer to collect their weapons and see who he had just shot, he recognized one of the dead. As usual, the electricity had gone off in the hospital when he recounted the story. It was cold and dark. Lieutenant Amar looked away for a second, sniffed, studied his fanned-out hand of cards. Click HERE to watch video from some of my interview with Lt. Amar. This entry was posted in Political by Greg. Bookmark the permalink.